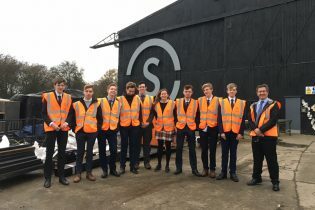 A Level Product Design students from Harrogate Grammar and King James’s School in Knaresborough visited us earlier this week, gaining valuable insight into how the skills they learn at school can be applied to the real life world of making. Each group had a presentation from Marketing Director, Tim Leigh, followed by a tour of our 12,000 square metres of manufacturing workshops and test build facilities. They were lucky enough to see one of our current projects being modeled in CAD, in production in several different workshop departments and undergoing the first stages of a complex test build. “They were absolutely buzzing on the drive back to school! It was fantastic to see how relatable what we do in school was to many of the areas you showed us – use of CAD software, modelling, prototyping, CNC manufacture and fabrication.” Alan Bolger, King James’s School. 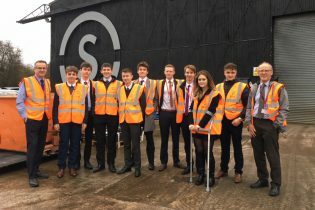 ”It was great for our students to witness how design technology can be used in industry, how varied and interesting it can be, and how much engineering prowess is valued. Everything they saw reinforces the possibilities of our subject, and will hopefully lead to some future Design Tech entrepreneurs.” Craig Bulmer, Harrogate Grammar. It was wonderful to have the opportunity to lift academic subjects out of the classroom, giving students an idea of the exciting directions that a career in design or engineering can take them.